Water is the ultimate equalizer. Canoeing and kayaking are activities that emphasize ability. Skill is determined by ability and attitude, and people at all skill levels, with and without disabilities, can find enjoyment in canoeing and kayaking. All that paddlers need are the willingness to accept instruction and be challenged and the ability to adapt to new situations. Canoeing and Kayaking for People With Disabilities presents strategies that give people of all abilities the opportunity to discover the challenge, freedom, and renewal found in paddling. The book, written by adaptive paddling pioneer Janet A. Zeller, will help you build on your existing knowledge of paddling techniques so you can share the sport with a variety of people with disabilities. 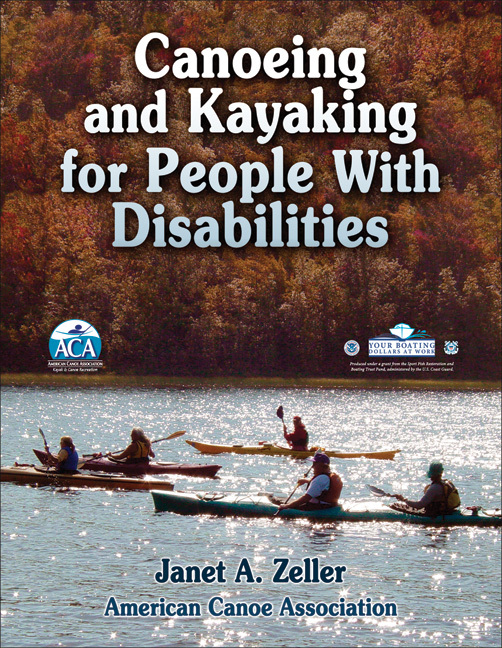 Zeller presents best practices based on her years of experience as a paddler with a disability and the experiences of other instructors and recreation and health care professionals. The text includes tested instructional techniques and equipment adaptations as well as safety information and rescue protocols. The book also includes numerous resources, checklists, and forms to assist you in running your program. Pretrip resources such as the medical information form and the Paddler's Interview will help you collect information about each paddler's medical history and discuss expectations, ability levels, and concerns. You'll also find tips on choosing trip and instruction locations, gear checklists, and an emergency response plan checklist. A glossary provides information on diseases and conditions to assist paddling instructors in developing appropriate accommodations. Paddling provides unique opportunities for people of all abilities to overcome personal challenges, master new skills, experience the outdoors, and enjoy physical activity with fellow paddlers. Packed with information about safe adaptations, techniques, and integrated opportunities, Canoeing and Kayaking for People With Disabilities is your resource for making paddling a reality for those with disabilities. A reference for recreation, camp, and health care professionals; paddling instructors; people with disabilities; and recreation and leisure students learning how to integrate people with disabilities into canoeing and kayaking experiences. A resource for outdoor and recreation organizations seeking to provide people with disabilities access to canoeing and kayaking opportunities. Also a text for ACA Adaptive Paddling Instructor Training Workshops.